A police officer who admitted making and distributing more than 300 indecent images of a child has been sacked. Lee Bartram, 44, from West Midlands Police, who worked in Birmingham city centre, was found to be guilty of gross misconduct. He admitted seven charges at Walsall Magistrates' Court on 16 August. Chief Constable Dave Thompson said Bartram's actions were met with "disapproval, horror and disgust" from fellow officers. He said Bartram's actions had "undermined trust and confidence in policing" and had caused shock among colleagues, but their level of "disapproval, horror and disgust was higher". The criminal charges against the inspector, from West Bromwich - spanning a period between August 2013 and August 2018 - related to a total of 328 images, including some found on an iPad and an iPhone. Prosecutor Mark Cooper told the court in August that some of the films made by Bartram had a "commentary" from the officer "as to what he would like to do" with the children. However, Mr Cooper said Bartram had not acted upon his "fantasies" in the virtual world. Bartram did not attend the five-minute hearing at the force's headquarters in Birmingham and will be sentenced for the criminal charges next week at Wolverhampton Crown Court. 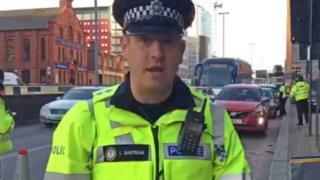 West Midlands Police said the force had made a voluntary referral to the Independent Office for Police Conduct.